The mountains of Tibet are studded with outstanding fortresses and Buddhist temples, dating as far back as 1,40o years ago. Built by skilled masons and draped in cloth spun by nomads, these religious and secular structures are magnificent and unique. Yet Tibetan architecture remains underappreciated, and many buildings are not widely known because of the difficulty and remoteness of the terrain. 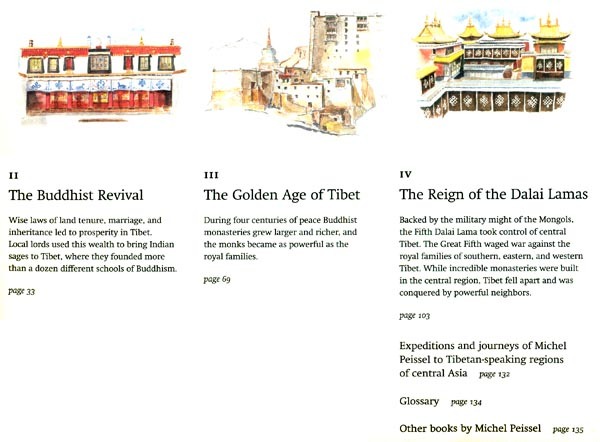 Tibetan Pilgrimage: Architecture of the Sacred Land is the result of forty-five years of study by author and illustrator Michel Peissel. 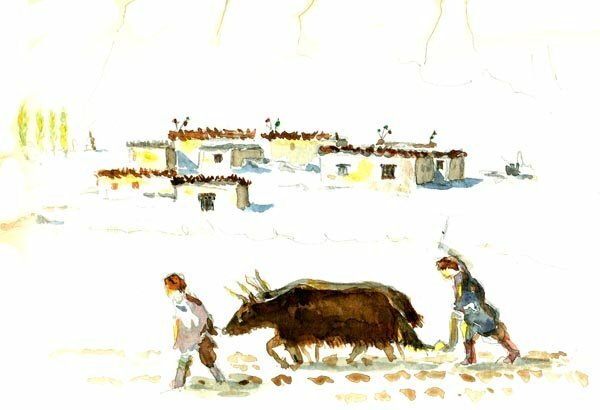 In twenty-nine expeditions—on foot and on horseback—Peissel journeyed to the farthest reaches of the Tibetan world to sketch extraordinary monasteries and clifftop palaces. With nearly a hundred exceptional watercolor illustrations, this book reveals the elegance, variety, and originality of Tibetan architecture in all its splendor. 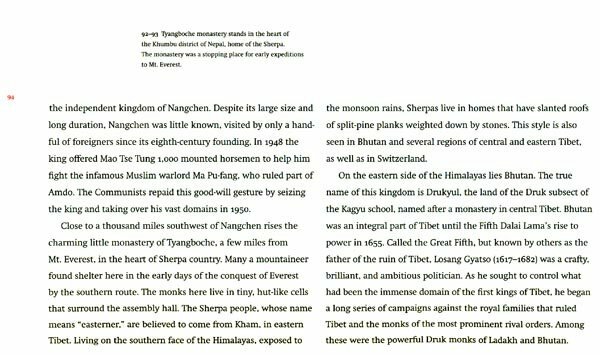 Peissel tells the story of the creation of the Tibetan empire in the seventh century, the rise of Buddhism, and Tibet's slow decline as local kings, Mongol conquerors, and ambitious monks carved up the once mighty nation. The 195o invasion of Tibet by the Republic of China was followed by complete occupation in 1959. Over the years, the Chinese looted and destroyed thousands of monasteries. However, Tibetan culture is still very much alive, from the Himalayas of Nepal to Mongolia, in regions that now appear on atlases as China, India, and Pakistan. New buildings continue to appear in traditional Tibetan styles, constructed according to centuries-old methods Tibetan Pilgrimage: Architecture of the Sacred Land at long last bestows on Tibetan architecture the admiration it so richly deserves. Explorer, anthropologist, and author, Michel Peissel has dedicated his life to investigating the remotest regions of greater Tibet. In the course of twenty-nine expeditions, he became the first anthropologist to study and explore the small kingdom of Mustang, eastern Bhutan, Zanskar, and the kingdom of Nangchen, where, in 1994, he discoverer the elusive historical source of the Mekong River. A Frenchman educated in England and the United States, he has written nineteen books in English about his expeditions. Many of these books became international best sellers, among them The Lost World of Quintana Roo; Mustang: A Lost Tibetan Kingdom; and The Cavaliers of Kham: The Secret War in Tibet. 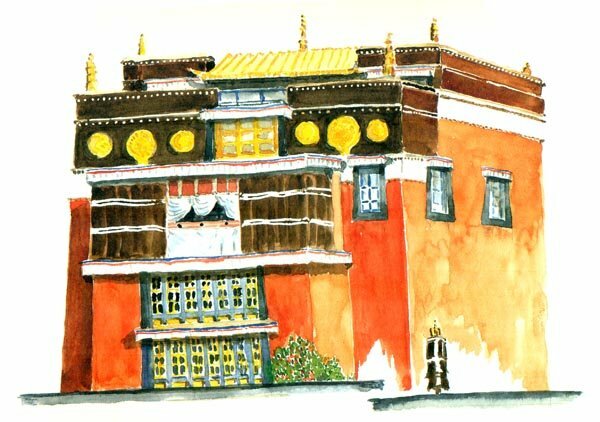 This book reveals that he is also an excellent artist, as his watercolors brilliantly illustrate the subtle beauty, elegance, and grandeur of Tibetan architecture. On my first visit to the Himalayas, I lost my heart to the Tibetan people. What seduced me was their sense of humor and open-mindedness, their emphasis on intelligence and wit above all virtues, and their belief that hypocrisy and pomposity are the worst of sins. I was surprised to discover that in the Tibetan language the words for beauty and happiness are interchangeable. Tibet is a relatively poor country, but the Tibetans take great care to make things beautiful. They braid their ponies' tails and decorate their houses, asking, "Who would want an unhappy pony or home?" They live in the midst of the staggering beauty of the Tibetan highlands, lit by the golden clarity of the high altitude. Fifteen centuries ago a Chinese chronicler described Tibet as covered with towers and forts. This is still true today, with the addition of the magnificent temples and monasteries that appeared in the wake of Buddhism. As I wandered the Tibetan highlands I was constantly struck by the majestic elegance of these buildings set upon crags, enhancing the natural landscape. Thus was born my interest in Tibetan architecture. Professor Rolf Stein, the distinguished Tibet scholar, served as my thesis advisor, and assisted me in planning my journeys to the most remote regions of Tibet. On my return he helped me to better understand what I had seen or brought back. He encouraged me to record everything during my travels, because we know so little about Tibet and its customs. 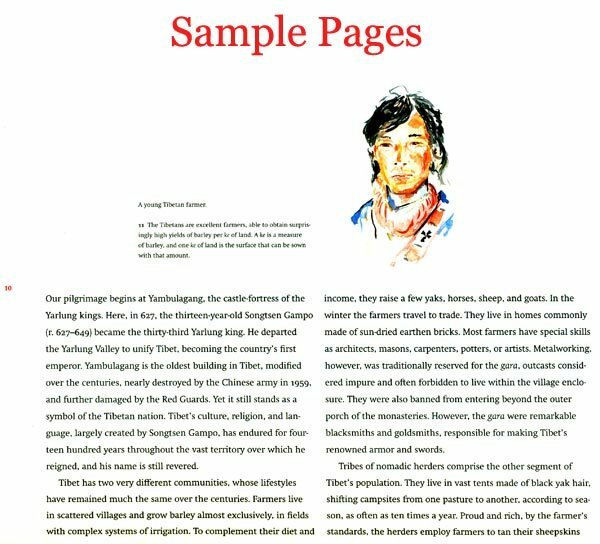 Year after year, for forty years, I traveled on foot and horseback into the far recesses of the Tibetan world. I visited every temple, monastery, tower, and fort on my route. I now have more than 10,000 photographs, but few do full justice to the elegance and beauty of the architecture. 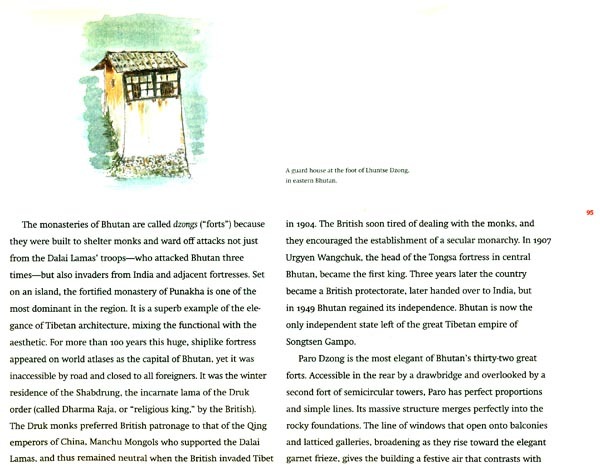 It was by chance that I attempted my first watercolor, depicting a modest Bhutanese house. Then I understood that in order to illustrate a building, one has to comprehend the process of its construction: Is the material wood, stone, adobe, or brick? How did the carpenters assemble the window frames? The artist must learn and analyze what the lens of a camera cannot see. While painting the illustrations in this book, I constantly referred back to information I had gathered from masons and carpenters. Although my work is but a poor reflection of the genius of Tibet's master builders, I hope that this book may contribute in a modest way to a greater appreciation of Tibetan architecture and help inspire the admiration it deserves. Beyond their elegance and originality, Tibetan buildings are the undeniable witnesses to the true geographical range of Tibetan culture and its enduring vitality. Standing stones, ancient graves, rock carvings, and stone shelters reveal that Tibet was inhabited in prehistoric times. A campsite in Amdo that dates back 8,000 years shows that the ancient lifestyle of the nomadic herders of the Tibetan highlands has remained very much the same. Tibetan written history begins in the mid-seventh century with the creation of a Tibetan alphabet, but earlier Chinese records describe the towers and fortresses of Tibet, from which rival princes ruled the land. 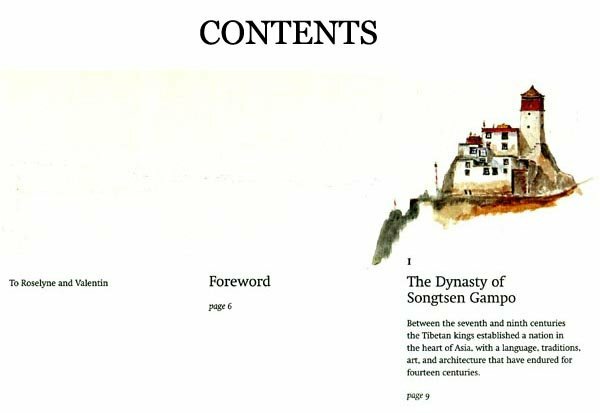 Songtsen Gampo, the founder of Tibet's first royal dynasty, united these local leaders in the seventh century, establishing an empire that dominated central Asia for three centuries. Tibet developed into one of the great cultures of Asia, whose achievements in the arts, poetry, literature, engineering, medicine, and architecture rival those of neighboring China and India. The dynamic sophistication and originality of the Tibetan way of thinking exerted an influence much larger than the country's small size would suggest. Buddhism came to Tibet from India and was later backed by Mongol military power. 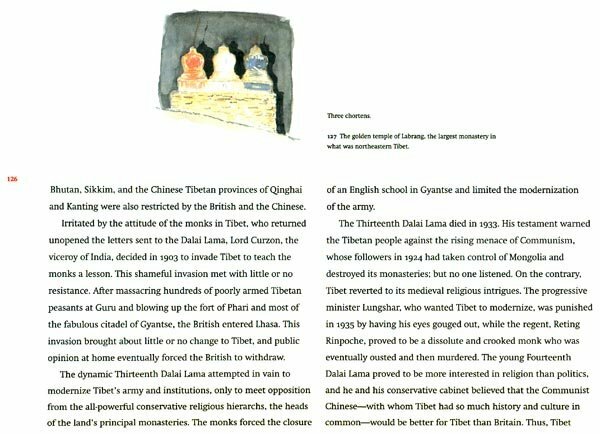 In the seventeenth century, as religious leaders sought greater control over the country, Tibet plunged into a dark age of civil wars, isolation, and bigotry. The Dalai Lamas' bid for political power failed, resulting in the fragmentation of Tibet. While the Dalai Lamas ruled over the central third of the country, the rest of Tibet, divided and impoverished, was taken over by India, Pakistan, Nepal, and China. Tibet has disappeared from the political maps of the world, but the Tibetan people have survived. Their vitality stems from a culture that puts power in the hands of the young rather than the old, as in most agricultural societies. Today, with the help of the Internet, television, radio, and tourism, the Tibetan people are more aware than ever of their common heritage. They are certain to outlive the religious and political forces that have caused their momentary eclipse, and hope exists that Tibet will one day regain its independence. In the meantime every facet of Tibetan culture is still very much alive, from Ladakh to Gansu, Mustang to Mongolia, Bhutan to Sichuan, where Tibetan books, buildings, and works of art continue the cultural traditions and customs of a land long considered one of the most sophisticated in Asia.